“I’m very liquid”, you hear the giants of industry say. I think we all jump to the conclusion that the person making the statement has a lot of cash. In general, we would be right. Liquidity by definition is a company’s ability to convert its assets into cash to pay its liabilities. It’s often expressed in the form of ratios like the current ratio. But few people understand the state of liquidity they might be in and how to become “liquid”. Cash is the simplest to understand, as that is considered the most liquid state. But there are other assets that can be converted to cash. So, let me use the state of matter to describe liquidity and an assets nearness to cash. In this example, I’ll use cash as the “water” or liquid that we are trying to convert other forms of water into. On the balance sheet, water is easy to find since it is usually label cash. There are other current assets that aren’t quite water yet but are pretty close. I call them the slush on the balance sheet. They are usually the other current assets you have within the company. Things that can be converted to cash within 1-year fall into this category. The slush consists of your inventory, accounts receivable, supplies, and prepaid expenses to name a few examples. These are slushy because it takes a little bit of time to turn them back into water. Most companies have some of their assets frozen in ice. 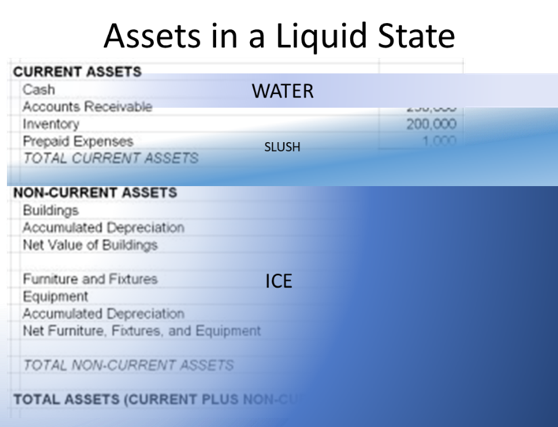 The ice I’m referring to are the fixed assets you have purchased to run your business. Fixed assets help you produce revenue and profit and are therefore a critical component of your company. To convert them to water (cash), it takes a different amount of time, energy and effort. Moreover, by converting your assets into cash, you are also taking away part of your ability to produce revenue. I call these assets frozen in ice, since most of the time we will not be trying to use them to make water. 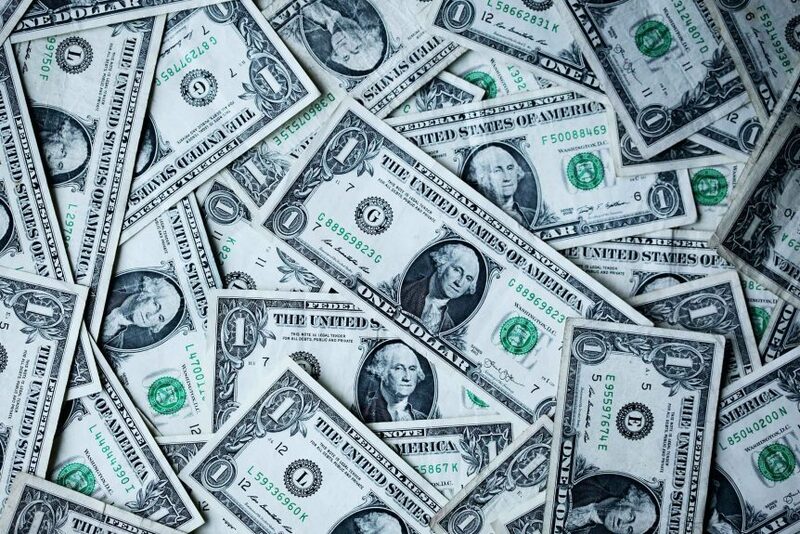 Being able to convert assets to cash quickly has a couple of different benefits. First is your company’s ability to work itself out of a crisis. Probably no one in Houston or Miami in 2017 though they would be in a hurricane situation that would crush their livelihood, but it happened. Those companies that could convert their assets to a more liquid state, were in a better position to survive and rebuild. Another reason to consider the liquidity of your company is if you want to apply for financing or credit for your small business. Your current ratio shows lenders how strong and capable your company is at generating cash. A good point of reference for your current ratio is 2.5 or less. This means that for every dollar your company owes in current liabilities, it also has $2.50 in cash to pay for it. Lastly, monitoring the state of your liquidity will help you make better business decisions. Low liquidity could signal a company that is struggling financially. Where too much liquidity can also be a problem. There is a such idea as under utilized capital that can stunt your company’s grow or make you blind to taking advantage of opportunities. The important measurement of success is to make sure you have enough money to cover your day-to-day operation. Seth David is the chief nerd and President of Nerd Enterprises, Inc, a company that provides consulting and training services in Accounting and software. Consulting services range from basic bookkeeping to CFO services such as financial modeling.